Had lunch with the family this weekend! 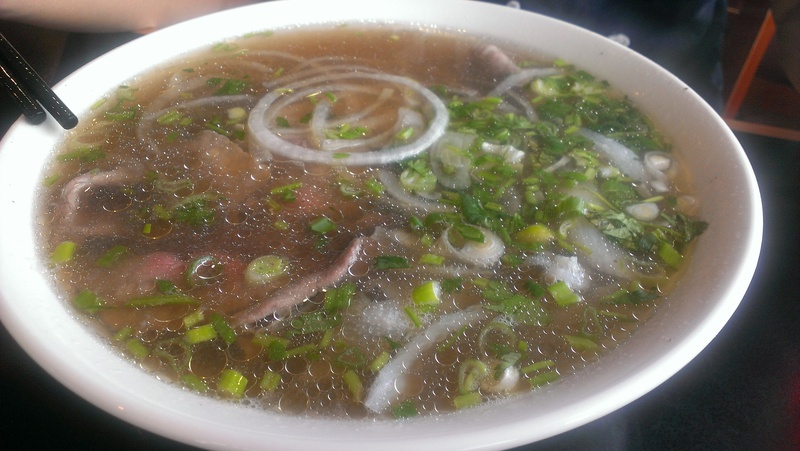 We randomly decided to go for pho at my dad’s suggestion. Plus due to some other things going on it was way too late for dim sum so we went to Pho Long. I’ve never been here before and the interior looked fairly nice and clean and un-sketchy if you know what I mean. There was a big screen TV in a corner and the whole restaurant had a lot of plants decorating it as well as a huge fish tank right at the entrance. The ceiling also had some brightly colored neon light decorations. The menu had the usual noodle soups and rice dishes but I noticed that they didn’t have any banh mi. I ordered the BBQ chicken with a spring roll on rice and my bro go the BBQ lemon grass chicken on rice which was essentially the same thing as mine minus the spring roll. 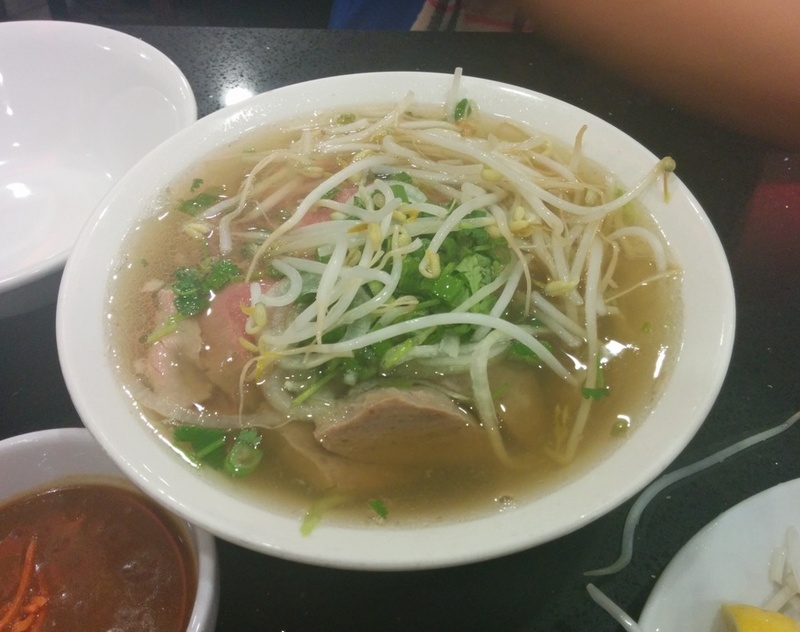 Both our dishes also came with some “soup” which essentially tasted about the same as the usual pho broth. We also got some sweet sauce for dipping the spring roll and for the salad and whatever else you want to use it for. Ok for $7.60 this was a very generous portion of chicken and rice! I really like the chicken and the sauce they used for it. It didn’t really taste like BBQ sauce but it was more sweet. The spring roll had a lot of meat filling along with some carrot bits and the skin was crispy. I was also happy there were pickled carrots and daikon on the side! I love pickled stuff and I haven’t had those in a while. Here is the non-spring roll version! It had more chicken so this looks like the better deal and it was $0.75 less too. 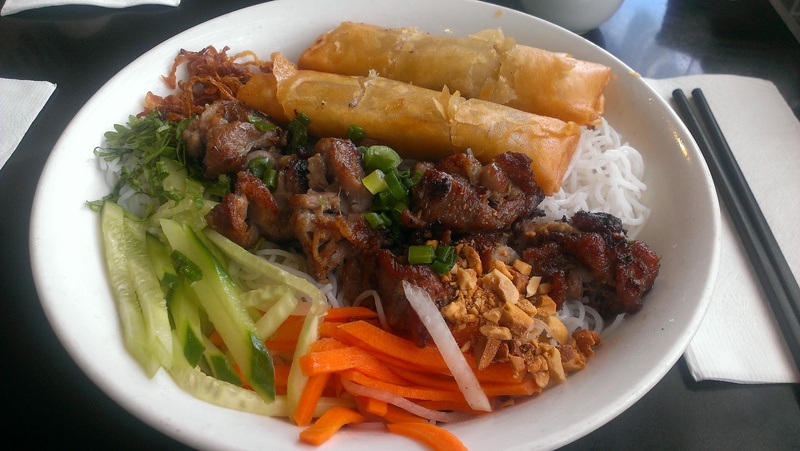 Get this if you don’t care much for spring rolls. This was my mom’s and I think it had beef tripe, beef tendon, beef brisket and well done beef flank. I thought the well done flank was a bit too well done but otherwise it was good. This was rare beef, beef tendon, beef brisket, and beef tripe. My parents commented that the broth was not too salty so they were quite pleased with that. By the way these were pretty cheap too! A small was $5.95 and a large was $6.85! Both of these were larges. The usual sauces and condiments. This was from another table and some of the condiments at our table didn’t have lids on them for some reason… o__O so that would be my only complaint. The meal was definitely cheap! 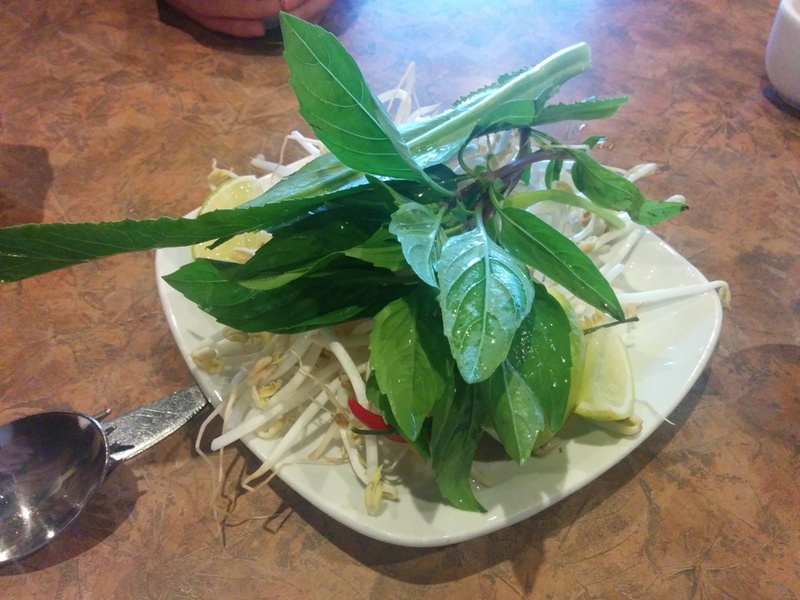 This entry was posted in Food Reviews and tagged BBQ chicken, pho, Pho Long.